President Barack Obama announced yesterday (5/1/2011) that Osama bin Laden had been killed. As historic and newsworthy as that event is, this post isn’t about that event. Instead, this post is about the technology and the science mostly likely used that lead to the confident identification of Osama bin Laden as the deceased person. Some reports such as the Navy Times (http://www.navytimes.com/news/2011/05/ap-bin-laden-dna-050211/) reports that he was shot in the head. I can already imagine the conspiracy theorists will be out in droves questioning the validity of the identification and the technology used. According to reports going back to 2006, a company named ACAGI Inc., in partnership with researchers at the University of Maryland, developed a portable face recognition system called the Image Acquisition and Exploitation Camera System (IAECS).These devices have been spotted and deployed in the theater. ACAGI’s Image Acquisition and Exploitation Camera System (IAECS) is loaded with previously taken photos of potential threats. As a soldier’s camera pans over faces, the system converts them into digital images and compares them with the stored photos. Rama Chellappa, a professor in the Clark School’s Department of Electrical and Computer Engineering, developed one of the face recognition technologies ACAGI will use. Electrical and computer engineering graduate student Raghuram Gopalan will port Chellappa’s technology to the company’s system. ACAGI will license this technology from the university. Chellappa’s face recognition occurs in three steps. First, the system searches for oval shapes and detects that a face exists in a video stream, and saves it as a digital image made up of tiny dots, or pixels. The system then creates a simplified map of the enclosed face based upon the light values of each pixel. Lastly, it compares the newly created pixel map with existing photos, and selects a similar match, if one exists. While the IAECS will store tens of thousands of known face records, it also categorizes new faces it sees and saves them for later, an operation the Department of Defense calls “marking and tagging”—its second-highest priority next to finding improvised explosive devices—according to Spatharis. The limitation of such technology is in its specificity in the population. It is not enough just to measure accurately the distance between someone’s eyes, for example; the biometric calculation also must take into account how common the result is in a given population. In terms of the DNA evidence, in order for DNA identification to be useful or even possible, we must have an exemplar from that person to compare the unknown against. It is unknown at this point whether or not our government had an exemplar of Osama bin Laden. DNA testing comes in a lot of varieties and forms. Each has its own usefulness and its own weaknesses. The specific type of testing most likely used was Mitochondrial DNA or mtDNA. MtDNA is only passed from mother to children. So all siblings to the same mother will have the exact same mitochondrial DNA. In comparison to extracting nuclear DNA, mtDNA isolation is easier due to the presence of multiple copies in a cell. In humans, there are two copies of nuclear DNA (nDNA) in a cell; whereas, the mtDNA copies range from 100-10,000 per cell (except in egg and sperm cell). Hence, very small samples can be tested for victim identification. 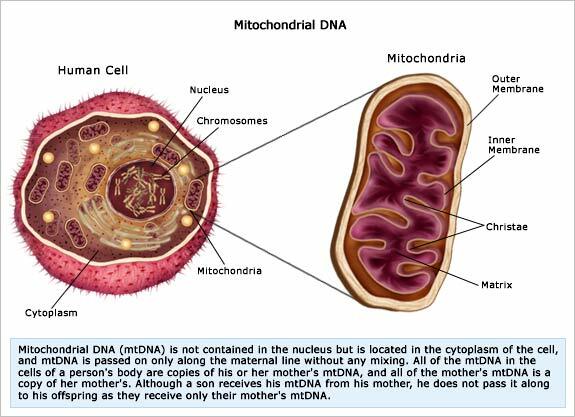 In general, a mitochondrion contains at least 2-10 copies of DNA. Since mtDNA is inherited from the mother’s egg cell, it can be used to establish the maternal lineage. In simpler terms, the mtDNA of both mother and child are same. Hence, mtDNA analysis serves as a valuable tool, while investigating the case of a missing person, and oftentimes is used in disaster identifications such as Katrina and the World Trade Center. The mtDNA from the unidentified remains can be compared with the mtDNA profile of a maternal relative (such as brother and sister, mother and her daughter). If the mtDNA profiles of the two individuals “match,” then they are relatives. The only limiting factor of mtDNA analysis is that there is little discrimination between the mtDNA sequences of the same maternal lineage. Osama bin Laden was born the only son of Muhammed bin Laden’s tenth wife, Hamida al-Attas. According to her Wikipedia page “Osama bin Laden was her only child with Mohammad bin Laden.” Osama’s mother then married Mohammed al-Attas. The couple had four children, and Osama lived in the new household with three half-brothers and one half-sister. This leaves a total population of five (OBL and his four half-siblings). So provided that the sampling, testing and reporting was performed perfectly if mtDNA was used, and given that the there is little discrimination between the mtDNA sequences of the same maternal lineage, then we would only need to be concerned about those three half-brothers (as we can eliminate the one half-sister as she may be dead according to the ABC report above and as the body would be of the wrong gender). If we can confirm their whereabouts in real time and again assuming perfect analysis then we should have confidence in the identification. There is a second issue that is making waves on the internet and that concerns the timing involved in the DNA analysis. If the President was accurate in his address to the United States, he authorized the action on that very day (“Today, at my direction, the United States launched a targeted operation against that compound in Abbottabad, Pakistan.”), the assault appears to have happened some time not before 3 PM Eastern Standard Time (Osama Bin Laden death raid live-tweeted by accident). Even under the most ideal of situations, this would leave about seven hours to gather the sample, prepare it, test it, and scrutinize the results. How do we get DNA confirmation that quickly and by what means? Is that enough time using modern methods and instrumentation? The answer is: Possibly and maybe. In fact, How Do You ID a Dead Osama? by Christie Wilcox agrees that there is enough time. A large function of the time that it takes a typical crime laboratory to conduct DNA testing has to do with where you are “in line” with the other samples. There is such high demand for analysis and so few technicians that there is a backlog. However, I would imagine that having the body of Osama bin Laden would be a life-changing event in a technician’s life where that person would be immediately requisitioned to stop everything else and perform the testing immediately. The act of DNA sequencing itself does not take more than 2-3 hours to perform. Ideally, the technician would want to verify this by way of repeat analysis for certain. This process at its fastest can take between several hours at its fastest. If there is not concurrent repeat analysis, then this can take more time. Another rumor that is gaining traction on the internet is that a new method of ultra fast DNA testing was used in this special case. The entire process from taking the sample from a suspect, to database compatible DNA profile production can currently be achieved in less than 4 h. By integrating such an instrument and microfluidic cartridge with the forensic process, we believe it will be possible in the near future to process a DNA sample taken from an individual in police custody and compare the profile with the DNA profiles held on a DNA Database in as little as 3 h.
Like all things in life and in science, we have to reserve conclusions and not blindly trust unless we have the raw data. However, the technology is available and possible. If employed correctly, then the conspiracy theorists objections seem not to be well founded (at least scientifically). This seems to be an orthogonal approach to the identification. I am the one who gave you ( or someone in your family) the piece of paper at the airport.